LOCATION!!! Best Location! 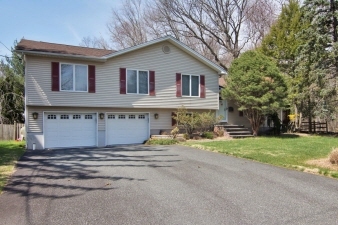 A Beautiful SPLIT LEVEL Home located on a dead end with beautiful woods next door! As you enter the home you will notice the open floor plan with beautiful hardwood floors through-out,living room,dining room with sliding glass doors to a huge deck overlooking your private backyard which is great for entertaining and having fun. The open kitchen with granite countertops with plenty of cabinets and new appliances. the second floor with a full bath, two good size bedrooms. The master suite with a master bath and two huge closets plus a 2 car garage. the basement off the kitchen has a full bath,office/den, then the 2nd basement great for storage, laundry room and a good size rec room. Credit check,interview required plus tenant responsible for one month commission and 1.5 month security deposit at signing of lease.